One of the most distressing things that can happen to an aquarist is when fish simply stop eating and die. Sometimes it's a sign of disease but on other occasions nothing seems to be causing it, so it's hard to work out what to do. In other cases, fish do eat but still keep getting thinner. What's going on? The truth is that fish, just like humans, can suffer from a variety of eating disorders. If you're able to diagnose these successfully, they can often be resolved. As with humans, one of the most common causes of weight loss in fish is stress. This can be caused by social issues like bullying, feeling overcrowded or being in too small a shoal (in which case a fish may be constantly afraid of predators). It can also be triggered by poor or frequently fluctuating water quality. Fish who are stressed may simply lose interest in eating, or they may be unable to assert themselves when others vie for food. Try to remove likely stress factors. Adding a chemical booster like Liquisil General Tonic may improve your fish's mood. Stressed fish can often be tempted by high protein treats fed to them directly, e.g. by pipette. Many popular fish foods are made using cereals that are high in gluten. Because this is not a part of the natural diet of most tropical fish - even plant-eaters - gluten allergies are common. They often give fish a bloated appearance, especially around the belly, and they can lead to balance problems as the swollen gut presses on the swim bladder. Affected fish may float at the surface or struggle to get up off the bottom of the tank. Despite this swelling, fish with gluten allergies face gradual starvation because they can't digest their food properly. Fortunately there is now a good variety of gluten-free foods on the market. If you are dealing with an urgent case and can't quickly get hold of these, feeding small pieces of meat, fish, peas or sweetcorn (without their skins) will help to clear the gut and restore health. Only permanent dietary change will help in the long term. Some fish really struggle to eat food from the surface. This can happen to individuals of any species, but is a bigger risk with fish who would not usually feed this way in the wild. Swallowing too much air when grabbing at pieces of food can lead to bloating and digestive problems. Affected fish will often become stressed - think about how you feel when your stomach is gassy. If you're dealing with this problem in a new fish it can be worth persevering, but some fish just can't get it right. A persistent problem can lead to internal damage or put fish off eating altogether. If it goes on for more than a few days, then, you should try switching to a different kind of food. There are many pellet foods available that provide good all-round nutrition. For carnivores - cooked beef or salmon. For herbivores - fresh cucumber or green peas. For omnivores - cooked egg yolk, or any of the above. Remember that rich foods like these can overwhelm your other fish, so take care to feed them selectively. If a fish has stopped eating due to ill health and exhaustion, it may no longer be able to feed in the usual fashion. This mean it's up to you to give it extra help. Feeding by hand can work, as sick fish usually lack the energy to panic if you approach them. If they won't take food from your fingers, use a pipette or plastic tweezers to offer tempting morsels. Don't overwhelm you fish, but make small offerings every hour or so. If your fish cannot take solid food at all, move it to an isolation tank and add a liquid fry food to the water. This will enable the fish to absorb nutrients with no effort at all. It's not an ideal diet for an adult fish but it can provide a vital boost during convalescence. As they recover you can then start to offer other things. Don't give up on fish who won't eat. 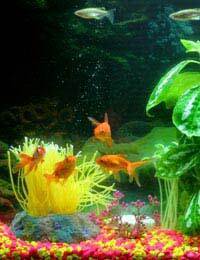 Generally their problems can be sorted out and they can return to being energetic, active members of your aquarium community.